Associate Professor Peter Limbrick just returned from London, UK where he presented a very successful program of films at the Tate Modern. 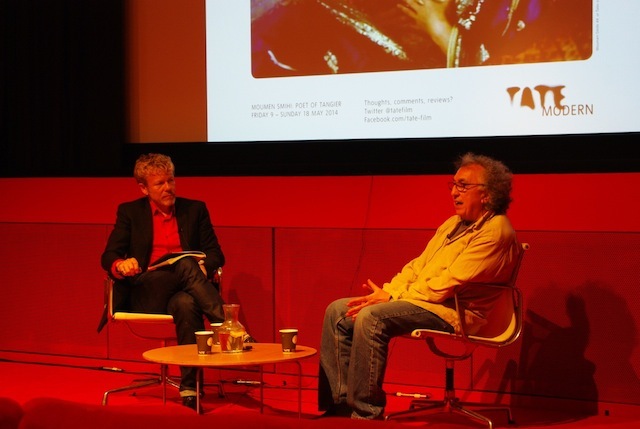 The Tate program he curated featured nine films by Moroccan director Moumen Smihi, whose work is the subject of Limbrick's next book. Limbrick introduced each film, compiled a program booklet with notes and translations of some of Smihi's many writings on film, and conducted on-stage Q/As with the director after several screenings. In addition to the 10-day program, Smihi's documentary With Matisse in Tangier is screening multiple times in conjunction with the major exhibition at the Tate Modern running through September, "Henri Matisse: the Cut-outs." Many of the films in the program were presented with new English subtitles by Smihi's regular subtitler, Laurel Hirsch, and two were world premières in their English versions. For With Matisse in Tangier and The Lady from Cairo, Limbrick worked with the Cinemathèque Française and the l'Institut National de l'Audiovisuel (INA) in Paris to obtain the original versions of the films. He then had them digitized in California, and employed two Film and Digital Media undergraduates, Alejandra Monteagudo and Dominic Romano, to produce digital subtitles for the films and export them to new Blu-ray versions for public exhibition. Monteagudo, who is fluent in French, was able to perfectly time the new subtitles to the French language narration of Matisse. Romano, also a fluent French speaker, worked alongside Limbrick to superimpose English subtitles on the existing French titles, while also re-timing them to match the original Arabic soundtrack. The director was thrilled with their work, which has enabled his films to reach new English-speaking audiences. Smihi is a key figure in Arab cinema with a long pedigree of films over the past forty years, many of them set in his home town of Tangier. The program Limbrick created, with assistance from Livia Alexander, has also screened at the Pacific Film Archive in Berkeley, the Walker Art Center in Minneapolis, and the Block Cinema at Northwestern University.